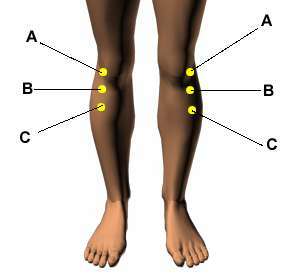 There are the acupressure points for relieving Knee Pain. Working on these points can help you get better quicker. You do not have to use all of these points. Using just one or two of them whenever you have a free hand can be effective. Location: On the inner edge of the knee crease, in the hollow between two tendons. Benefits: Knee pain, genital disorders, and abdominal pain. Location: On the inside of the knee, where the crease ends when the knee is bent. Benefits: Relieves knee pain, fibroids, and swelling in the knee. Location: On the inside of the leg, just below the bulge that is down from the inside of the knee and under the head of the shinbone. Benefits: Relieves knee problems, swelling, leg tensions, varicose veins, edema, water retention, and cramps. 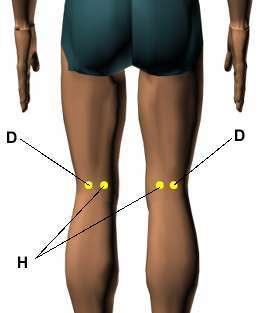 Location: In the center of the back of the knee in the crease of the knee joint. Benefits: Relieves knee pain, stiffness, arthritis, back pain, and sciatica.